My wife (and kids) think I am nuts. My “fleet” ranges from 10-14 boats depending on when you catch me. I have loved boats since I was a little kid. Below is a pic of a 1960 Glasspar, owned by family friends, in 1969 with me riding in it on the Hudson River in Red Hook, NY. I loved boats then as I do now, and boats from that time period hold a special place in my heart. Hence the reason all the boats I buy and restore are from those years of growing up on the river. My first restoration was when I graduated from college and wanted my own boat. I loved Sea Rays from when we used to visit lake George every summer and the lake was full of them. I found a 1970 Sea Ray, 24ft cuddly full of tomato plants in a field. I bought it and proceeded to restore it over the next 9 months. I used it for a few years and then traded it for a newer boat. We then always had a family boat for the wife and kids. My next restoration was many years later when my dad passed away and I needed something to keep busy. He loved Chris Crafts, so I figured why not find one that needs restoring and take it from there. I restored a 22ft 1955 Continental which I still have and will always have. I named it after my dad. Next, I actually found that exact yellow boat in the picture below from 1969 rotting away in an owner’s backyard and offered to buy it. I restored it and still have it. That really got me going on finding old boats and bringing them back to life. Sometimes I sell a few of them, but mostly I have my favorites and keep them. 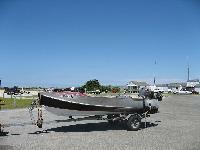 They have to be seaworthy and run, as every one of my boats goes out for a cruise at least a few times a year. Below is a picture taken on a day when the whole fleet was afloat. It looks like a lot of friends and family having lots of fun!